The National Highway Traffic Safety Administration has issued an urgent plea to a total of 7.8 million car owners in the U.S. whose air bag inflators have been recalled to get them repaired. The air bags, especially in areas along the coast with high absolute humidity, have inflators that can rupture. If the air bags go off in a crash, that can send shrapnel into the passenger compartment and injure people. The NHTSA said that its warning was especially urgent for owners affected by recalls in these areas: Florida, Puerto Rico, limited areas near the Gulf of Mexico in Texas, Alabama, Mississippi, Georgia, and Louisiana, as well as Guam, Saipan, American Samoa, Virgin Islands and Hawaii. The NHTSA first said 4.7 million cars were affected, but has since raised the number and issued corrections to its list. "The numbers cited for potentially affected vehicles below are subject to change and adjustment because there may be cases of vehicles being counted more than once," the agency said on its website. "Owners should check their VIN periodically as manufacturers continue to add VINs to the database. Once owner recall notices are available, owners can retrieve a copy from SaferCar.gov, or will receive one by U.S. mail and are advised to carefully follow the enclosed instructions." Car owners can look up their cars by VIN here or call the NHTSA’s Safety Hotline: 1-888-327-4236. Car companies, meanwhile, have begun to issue statements in response to the recall. Click here to read what they have said so far. 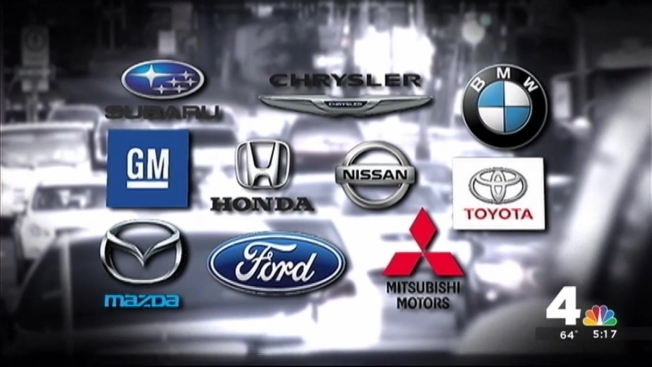 Here are responses from the car companies involved in the air bag recall. Responses have not yet been received from Honda, Ford and Subaru. “We are customizing Toyota’s customer letters and will send overnight letters to certain owners of 2003-2005 Pontiac Vibes in the high humidity areas that NHTSA has identified as being susceptible to the defective Takata air bag inflators. This includes 9,940 Vibes, but we are still working the numbers based on additional areas that Toyota identified in its expanded recall on Monday. Separately, NHTSA has corrected its advisory from Monday to show only the Vibes built in the former GM-Toyota joint venture and Saab 9-2X models built by Subaru for Saab are GM vehicles with Takata air bags. The original NHTSA advisory incorrectly listed a group of 2002-2003 GM models that were part of a 2002 recall involving air bags made by other suppliers. “Currently, we are not experiencing any significant parts shortages for the Takata passenger side air bag recalls initially announced this summer. Since Nissan and Infiniti to this point have been able to schedule customers for recall-related work quickly, we have not made any recommendations other than echoing NHTSA’s request to bring affected vehicles in promptly and have the work done at no cost to the owners. Nissan owners can check their vehicle identification number (VIN) at http://www.nissanusa.com/recalls-vin#/ to see all applicable recall actions that apply to their Nissan. Infiniti owners can check their VINs at http://www.infinitiusa.com/recalls-vin#/ to see all applicable recall actions that apply to their Infiniti. "The notification that you received affects certain 2004-2005 Lancer vehicles that are currently registered or originally sold in Hawaii, Florida, Puerto Rico, and the US Virgin Islands. Continued exposure to high levels of humidity may cause the passenger air bag inflator housing to rupture if the vehicle is involved in a crash where the front passenger air bag is designed to deploy. If this occurs, it may increase the risk of injury to the front seat occupants. Please contact your local Authorized Mitsubishi Motors dealer and schedule an appointment to have the front passenger air bag inflator replaced free of charge. Since this is an occupant safety concern, we recommend that you do not have anyone ride in the front passenger seat until the front passenger air bag inflator has been replaced. If you experience any problem having your vehicle repaired promptly and/or at no charge, please call us so we can be of further assistance."